Develop and Expand YOUR Creative Voice! Join us for inspiring demonstrations, lectures, encouragement and practice. You’ll learn how to coax hints of reality from an abstract background, how to control values and colors for emotional emphasis, and how to suggest rather than delineate. 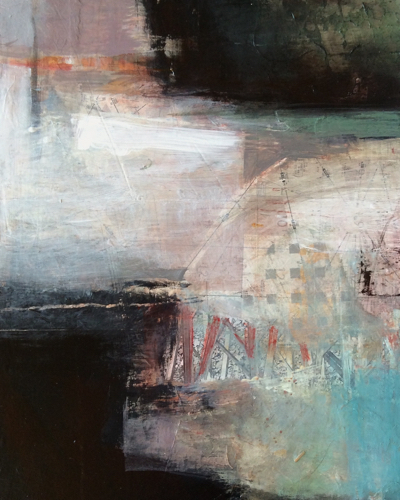 You'll explore working intuitively, responding to what shows up, working in a series, mixing and utilizing neutrals for softer, more ethereal abstracts. We will address attitudes of confidence, procrastination, vulnerability, curiosity, courage, talent, play, inspiration, intuition, your mean critic, metaphor, symbolic elements, competition, marketing, your belief systems, finding balance, and more! There will be plenty of time for "playing" and creating along with individual attention and guidance. Joan is especially gifted in helping students gain more freedom in the creative process and discover their own unique artistic voice. She believes that people are more open to learning and inspiration when they are having fun, so her workshops are filled with laughter and lightness. 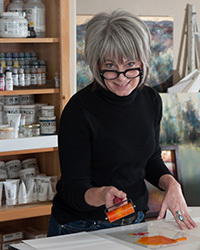 A multitude of approaches and techniques will give beginners encouragement and confidence, while more advanced students will benefit from Joan’s insightful solutions to their artistic challenges. Sign up to hear about the latest workshops. Click HERE for a short video showing a bit of my process for the painting below.